When we last saw Paul and Vince, they had saved the Colonel and were about to head for home in a special plane given to them by the General. But then, while in flight over the ocean, the sky suddenly blackens - the ocean begins to churn - and the plane goes spinning! A booming voice fills the cockpit: "Hear me, Warriors! Zang Zip, the War Dog, has enslaved the people of Earth. Only you can save us from his grip of evil!" Caught in a time warp, hurled thousands of years into the future, Paul and Vince know they have no choice but to meet this impossible challenge head-on. After all, they are professionals... they are the Ikari Warriors! --From the NES Ikari Warriors 2 instruction manual. Play Ikari Warriors 2 Now! 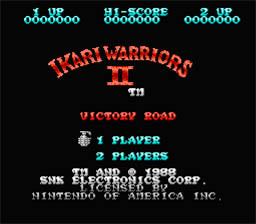 Like most Ikari Warriors titles, Ikari Warriors 2 was a pretty bad game. The graphics weren't very good, and the controls were unresponsive. There are some people that like these games, but I don't understand why. Ikari Warriors was pretty popular in the arcade, but it just wasn't ported very well to the Nintendo console. The Ikari Warriors series has done pretty well as a whole, I just didn't like the ones on the NES very much. If you are an Ikari Warriors fan, play Ikari Warriors 2, if not, then I wouldn't try this one. Kill everything in sight to make it through the game. Use grenades all the time, they are free!